Bitte beachten Sie die Warnhinweise auf der Umverpackung! 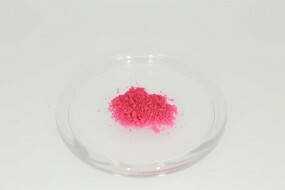 Thermochromic Pigment easily disperses in water and certain solvent based systems. It is also temperature stable up to 200°C making them suitable for use in most plastics. In the case of processing with aqueous techniques please use a wetting agent. Customer evaluation for "Thermochrome Pigment Purple"